In April 2017, the Olympic Council of Asia (OCA) reduced the number of events for the 2018 Asian Games, which got underway in the Indonesian cities of Jakarta and Palembang on August 18th, from the originally-announced 493 to 431 due to cost factors. Among the casualties was cricket, which had appeared in the previous two editions of the Asian Games, but lacked enthusiastic support from the bigwigs, particularly from India, the superpower of the game in the continent. After the Asian Cricket Council (ACC) successfully lobbied for the inaugural inclusion of T20 cricket at the 2010 Games in Guangzhou, the Board of Control for Cricket in India (BCCI) dampened the news by declining to send teams for both men’s and women’s events, citing international commitments. It did not even arrange for a depleted squad, which spoke volumes of the administrators’ apathy towards cricket being played at the quadrennial sporting extravaganza. On the other hand, Pakistan, Sri Lanka and Bangladesh all sent second-string sides for the men’s event, while Pakistan and Bangladesh sent their women’s teams. Fast-improving Afghanistan brightened their medal hopes by sending a first-choice squad for the men’s event. The other nations in the men’s event were Hong Kong, Malaysia, Nepal, Maldives and hosts China. This presented a great opportunity for cricket to make an impact on the Chinese audience. Besides Pakistan and Bangladesh, the remaining teams in the fray for the women’s event were Japan, Thailand, Hong Kong, Malaysia, Nepal and China. All the games were contested at the Guanggong International Cricket Stadium, a venue boasting a capacity of 12,000 and which would go on to host the Women’s Asia Cup in 2012. The Chinese women impressed by entering the semifinals, defeating Malaysia and Thailand on the way - the latter by just one run. However, Bangladesh, captained by Salma Khatun, overwhelmed China by nine wickets to qualify for the final. In the other semifinal, Sana Mir’s Pakistan saw off Japan by the same margin. Japan procured a medal though, as they beat the hosts by seven wickets to claim the bronze. The final was dominated by Pakistan, who bowled Bangladesh out for 92 before winning by ten wickets. Off-spinning all-rounder Nida Dar shined with a haul of 4/16 and an unbeaten 51. The format of the men’s event allowed Pakistan, Sri Lanka, Bangladesh and Afghanistan direct entry into the quarterfinals. The rest of the teams played a group stage to determine the four other quarterfinalists. Pakistan made short work of China in the first quarterfinal, riding on skipper Khalid Latif’s unbeaten 103 to secure a thumping 128-run win. The Pakistani squad consisted of future internationals such as Aizaz Cheema, Raza Hasan, Sharjeel Khan and Bilawal Bhatti. Malaysia had their moments in the quarterfinal against Bangladesh, with left-arm spinner Sharul Nizam (4/21) restricting the Tigers to 150/7. But their batting was no match for the Bangladeshi spin attack, comprising of captain Mohammad Ashraful, Suhrawadi Shuvo and Naeem Islam, who combined to ensure a 70-run win. Afghanistan showed their intent by bundling Hong Kong out for 63 en route to a comfortable eight-wicket win that set up a semifinal date with Pakistan. The most closely-fought quarterfinal was the last one, between Nepal and Sri Lanka. After rolling Nepal over for 72, the Sri Lankans, led by Jehan Mubarak and featuring the likes of Kusal Perera, Malinga Bandara and Isuru Udana, made heavy weather of the chase by sensationally slumping from 31/1 to a precarious 56/8, before Kaushal Lokuarachchi and Sajeewa Weerakoon overcame the jitters and managed to scrape through for a two-wicket win in the 19th over. A resolute performance from Afghanistan condemned Pakistan to a 22-run defeat in the first semifinal, with economical spells from fast bowler Hamid Hassan (2/16) and off-spinner Karim Sadiq (2/17) paving the way for a successful defence of a middling total of 125/8. In the second semifinal, Sri Lanka went down to Bangladesh by five wickets after mustering only 101. Shuvo starred again with his left-arm spin, taking 4/6, while pacer Shahadat Hossain returned 3/29. Latif helped Pakistan win the bronze, anchoring a chase of 136 with a knock of 53* that brought a six-wicket win against Sri Lanka. 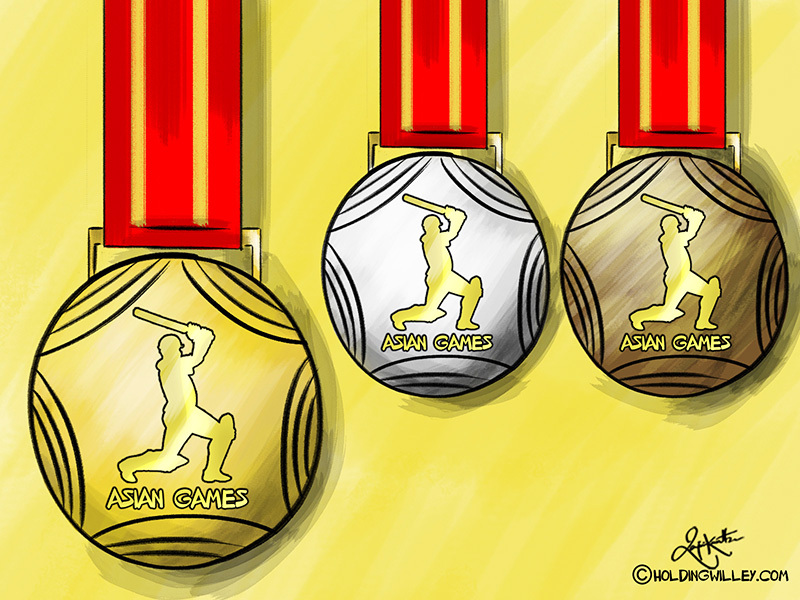 The final saw two nations that had never won a gold medal at the Asian Games. The Bangladeshi bowlers again clicked as a unit, limiting Afghanistan to 118/8. Bangladesh stuttered to 75/5 after 15 overs of the chase, but Naeem (34*) and Sabbir Rehman (33*) put together an unbroken 44 to seal a five-wicket win with three balls remaining. Thus, the appearance of cricket gave Bangladesh the satisfaction of their first - and till date, only - Asian Games gold. Prior to this success, the country had won only seven medals (four silvers and three bronzes) in nine editions of the Games since its debut in 1978. 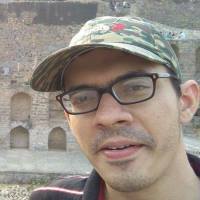 Latif was the highest run-getter in the competition, with a tally of 182. In fact, no other batsman scored more than 100 runs. Shuvo and Raza Hasan were the joint highest wicket-takers, with a haul of seven each. Cricket’s second tryst with the Asian Games was in the following edition in 2014, hosted by the South Korean city of Incheon. Once again, India were conspicuous by their absence from both men’s and women’s events. This time, Pakistan too were missing from the men’s competition, though their women’s team took part. Kuwait and Sri Lanka were the respective additions to the men’s and women’s events, besides South Korea, who played in both events due to being hosts. The Yeonhui Cricket Ground was the scene of all the cricketing action. China reached the women’s semifinals again, but were knocked out by Pakistan, losing by nine wickets after being shot out for 37. Nida Dar returned stingy figures of 4/7. Bangladesh set up a repeat of the 2010 final, by subduing Sri Lanka in the semifinal. Chasing 96, Sri Lanka crashed to 70, thanks to medium pacer Panna Ghosh (5/10). Sri Lanka won the bronze with a five-wicket win over China. The result of the women’s final was also a repeat of 2010, but the margin of victory was much closer. Disciplined Bangladeshi bowling kept Pakistan to 97/6, before rain curtailed the target to 43 from seven overs. At one point, Bangladesh needed 13 runs from 17 balls with eight wickets still in hand. However, Pakistan held their nerve under pressure, taking regular wickets to stymie the run flow. Bangladesh eventually ended at 38/9 to give Pakistan a four-run win and the gold. The first men’s semifinal saw Sri Lanka, under Lahiru Thirimanne, edge Bangladesh out in extraordinary fashion - the Tigers were 59/3 in 11 overs when rain intervened for good, and the match was decided by means of a coin toss. Bangladesh were nearly at full strength, with their squad led by Mashrafe Mortaza, and including Tamim Iqbal, Shakib Al Hasan and Mahmudullah. They entered the semifinal after a 203-run drubbing of Kuwait in the quarterfinal. Afghanistan dictated terms in the other semifinal, chasing down a revised target of 72 from 15 overs with eight wickets and 21 balls to spare after restricting Hong Kong to 88/8. But the gold proved to be elusive again, what with Sri Lanka prevailing in the final by 68 runs. After a blazing start by Thirimanne (57), Afghan captain Mohammad Nabi snared 4/18 with his off-spin to limit the target to 134. It was in vain though, as Afghanistan were dismissed for 65 in the 18th over. Bangladesh, gold medallists in 2010, beat Hong Kong by 27 runs to take the bronze. The Sri Lankan squad, though not at full strength, had quite a few players who were part of the team that won the Asia Cup in Bangladesh less than seven months earlier. In Upul Tharanga, Dinesh Chandimal (who topped the run charts with 116) and Thirimanne, they had a reliable top order that ultimately steered Sri Lanka to its first Asian Games gold since 2002, and its 11th overall.